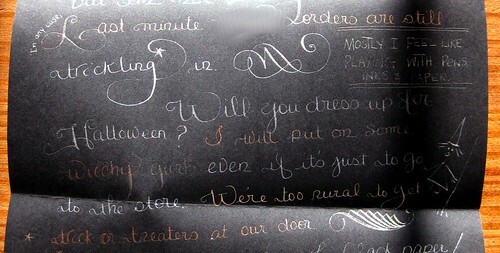 One of my pen pals is an artist who writes every letter in calligraphy with a flexible-nib dip pen. She often uses these marvelous metallic powders (dip pens only, not for use in fountain pens) for sparkly flair. After a conversation on The Fountain Pen Network (FPN), she sent me this letter, which was even more a work of art than usual! 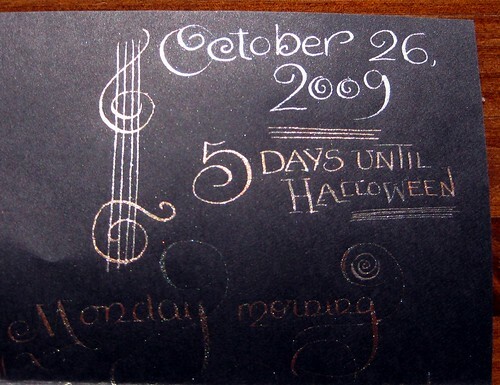 The theme at the time, of course, was Halloween - I love the artistic embellishments! I'll end with two different views of the same section, so you can see the different sparkles and the orange undertones of the metallic powders (I hope). wow some ppl are so talented with their mail art . thanks for sharing and posting this . wow, it's beautiful! i have a soft spot for anything glittery! That's gorgeous! Your penpal is really talented!